Thinking about snatching up a new Motorola Droid? If so, hold off. Motorola's yet-to-be-announced Droid 3 smartphone was allegedly spotted over the weekend in a number of leaked tutorial videos that reveal the phone is set for a significant update compared to the Droid 2. The videos (embedded below) surfaced via the German site PhonePads. 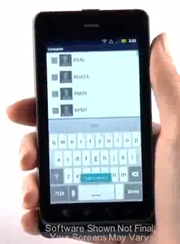 The video reveals the Motorola Droid 3 packs an 8-megapixel camera with dual LED flash, capable of 1080p HD video recording, but there's no sign of a dedicated camera button. Both microUSB and miniHDMI ports are on board of the Droid 3, for all your connectivity and video-watching needs. Owners of older Droid models will probably appreciate the improved slide-out keyboard on the Droid 3, which now has five rows, with the top row dedicated to numbers. The volume keys are also changed from the usual rocker to two separate keys on the right edge. Besides the few hardware specs outed in the leaked tutorial videos for the Droid 3, specs details are very sketchy. A watermark on the videos saying "Software shown not final, your screens might vary" indicates that Motorola is probably finalizing its Motoblur UI for Android, and depending on when the phones comes to market, it might even feature Android Ice Cream Sandwich. Earlier rumors also note the Droid 3's screen is 4 inches at a 960-by-540 resolution, but it's unclear whether the processor powering the phone will be an Nvidia Tegra 2, or OMAP. Techno Buffalo also heard from a tipster that the Droid 3 wouldn't have any LTE support, so no 4G for Droid 2 upgraders. Are the changes in Motorola's Droid 3 enough of an incentive for you to upgrade? Sound off in the comments.